I promise you more hints, but decided freezer paper is too large a subject for one post. One of my favorite uses for freezer paper is to use it for basting tape, especially for mitering borders. It is especially useful when matching border print motifs or a series of borders at the corners. 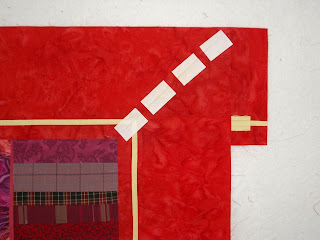 Cut your borders longer than the length and width of your quilt top. 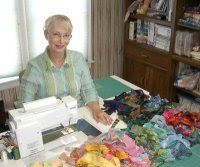 Generally, the borders should be at least twice the width of your borders plus the length or width of the quilt top plus 2 inches. There will be a little waste, but for a mitered border, this is important. Center and stitch the borders to the quilt edges, starting, stopping and backstitching 1/4" from each end. 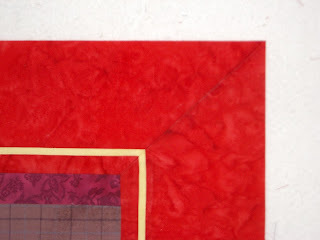 Apply all the borders to the quilt top before mitering the corners. Now, here's the fun part: At the ironing board, position the quilt top so that one corner is on the ironing surface and one border is on top of the other. 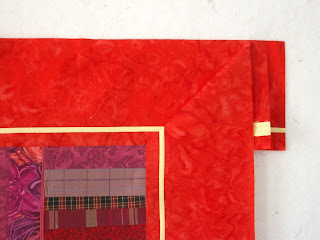 Fold the top border under at a 45° angle, matching the borders as they fall on top of each other. You may use a square-up ruler to make sure that the fold is truly at a 45° angle. Match the border stripe or multiple border seams, as shown. 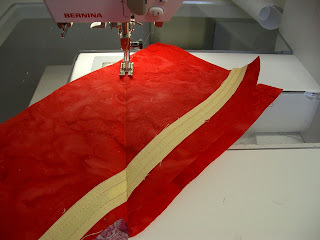 Next, cut several 1" wide strips of freezer paper. With a hot, dry iron, adhere them to the miter to hold it in place. (NO PINS, NO BASTING!) At the sewing machine, fold the top layer back, and stitch exactly in the fold, stopping and backstitching at the corners. 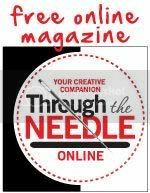 You should be able to see where the border seam meets the quilt top, so you will know where to stop and backstitch at the inner corner. Open out the seam and check for matched seams and the corner. If you are satisfied with the seam, remove the freezer paper strips, trim it to 1/4" and press it open. Wallah! You have a perfectly mitered border! Love that FREEZER PAPER! Wow, I never knew making mitered borders would be so easy. Well it sounds easy, anyway...i'll have to try it the next time I'm adding borders! Just found your blog today. So now I have to hurry home and try your freezer paper stencil idea and this wonderful technique for mitered borders. u r the best. thanks for sharing. Thank you, nana. (I think I e-mailed you the pattern for the freezer paper stenciled Rose Bud this morning.) Please share my information with your local quilt guild. I love to teach my techniques and present programs for guilds, and I would love to visit your guild.